I've used Montreal's Bixi bikes and they are really good. You don't need to own your own bike, so no a-hole is going to steal your bike. The ones in Paris were awesome, and I really wished we had them here for nights where I only want to bike one-way, or don't want to leave my bike locked up outside. The naysayers believe the bikes will be vandalized and stolen, and this has been a problem in other cities. In response, the program will require a credit card, and uses ugly bikes embedded with GPS tags. I hope these adaptations do the trick. It never ceases to amaze me that people steal crappy bikes. At some point, won't New York reach a saturation point in which the supply of used bikes allows everyone who wants a bike to get one cheaper than it would cost to steal? What does it cost to steal? Isn't it zero, if you don't get caught? I think it is unfortunate that we need to impose the credit card requirement, but it should help a lot to deter theft of bikes. No matter who the bike thief is, or what his skill set, there are opportunity costs to stealing a bike. For example, I could be shoplifting instead. If I was more skilled, I could be burglarizing. If I was a heroin addict and had heroin on hand, I am forgoing the opportunity to inject myself for the moment I am stealing your bike in exchange for getting something I can sell later to get more heroin. But, yes, it is unfortunate that only people who have the demonstrated means to buy a bike (aka a credit card with some "room on it") will be able to rent a bike. ...but I am ok with that. I love how all the Atlantic terminal Mall/Yards renderings have like cars in them. 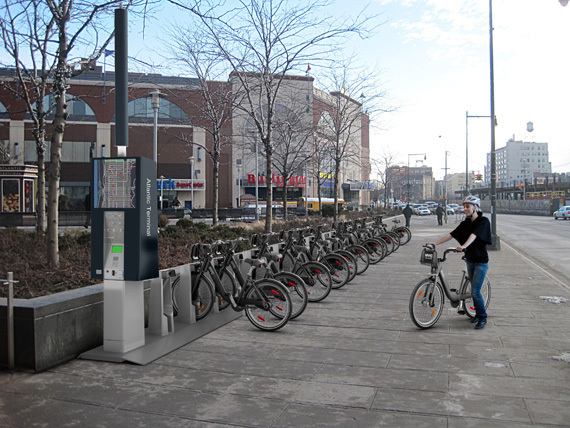 In Montreal, if you don't return the bike, your credit card gets charged $1,000. I wouldn't think it would be easy to steal a bike that has no resale value, except maybe the scrap value of the metal. I bet the rental bikes end up getting stolen less often than regular bikes that are usually stored outside. I do worry about the bored teenager who likes stabbing the tires of a rack of unattended bikes, but expect that such incidents can be paid for by the profits from rentals. I would be ok with a small subsidy from the city if this project is a money loser. Despite our collective suggestions that there be a rental location on every corner, I think it makes sense to re-claim some of the now-vacant bus stops. some scrap yards wouldn't take bikes, LOL its only when I offer them for free they took them. They saw a van full and goes no bikes. and i was like umm i'm throwing them out not looking for money!